The high-flying Utah Jazz crushed the Golden State Warriors to boost their chances of finishing third in the Western Conference. THE UTAH JAZZ moved one win closer to the number three playoff seed in the Western Conference with a crushing 119-79 win over reigning NBA champions the Golden State Warriors. 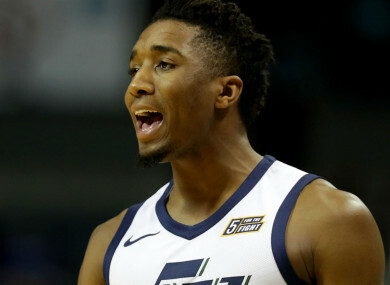 Rookie of the Year candidate Donovan Mitchell posted 22 points for the high-flying Jazz on Tuesday. Mitchell also set a rookie record for three-pointers, having gone four of five beyond the arc to take his season tally to 186 successful threes – surpassing Damian Lillard’s record. Utah are 29-5 since being nine games under .500 in January and are are 13th in offensive efficiency (108.5) and first in defensive efficiency (97.9 entering Tuesday) since Rudy Gobert returned from injury that month. Klay Thompson scored 23 points for the Warriors -who are locked into the second spot in the west – while Kevin Durant added 13 points of his own. Despite the poor showing, Golden State could benefit from the loss because they avoid playing both Utah and the Oklahoma City Thunder in the first round of the playoffs. The Jazz will earn the third seed with a win over the Portland Trail Blazers on Wednesday. Behind 28 points from JJ Redick, the Philadelphia 76ers captured a franchise-record 15th consecutive win with a 121-113 victory against the Atlanta Hawks. The playoffs cannot come soon enough for a red-hot Philadelphia team which can secure the third seed in the east with a win over the Milwaukee Bucks on Wednesday. While Philadelphia’s winning streak seems impressive, they have beaten just three teams above .500 (all at home) during the streak. The Boston Celtics are locked into the second playoff seed in the east but are carrying little momentum into the postseason after dropping their fourth game in the past week. Boston fell to the Washington Wizards 113-101, despite Jaylen Brown’s 21 first-quarter points. Boston will be without Kyrie Irving for the rest of the season and the Celtics turned the ball over 17 times against the Wizards and allowed 42 points in the paint. Email “The Sixers make it 15 wins in a row but the Warriors take a 'good' 40-point loss”. Feedback on “The Sixers make it 15 wins in a row but the Warriors take a 'good' 40-point loss”.